A long-time contributor to the GuitarFreaks & DrumMania series, Yoshihiko Koezuka first joined the series during drummania. Since then he's performed in every game in the franchise, and remains one of the biggest contributors to the series. Prior to working on drummania, he was a member of the KONAMI Kukeiha Club, a name for KONAMI's sound staff in the 1980s and 90s. In contrast to his mentor Mutsuhiko Izumi's hard rock sound, Yoshihiko Koezuka's music in BEMANI tends to drift more into a 1980s pop rock / ballad type of music. Beginning with Dreams in the night in GUITARFREAKS 9thMIX & drummania 8thMIX, he started signing many of his own songs. He's also one of the few GuitarFreaks & DrumMania artists aside from Asaki and Akhuta who writes the lyrics to most of his own BEMANI songs, even for those he himself does not sing. 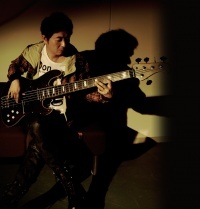 Yoshihiko Koezuka has also provided the bass for dozens of songs in the GuitarFreaks & DrumMania series, both KONAMI originals and licenses alike, and still does to this day. Since GuitarFreaksXG2 & DrumManiaXG2 Groove to Live, Yoshihiko Koezuka has been the sound director of the GuitarFreaks & DrumMania series. Yoshihiko Koezuka is one of the few GuitarFreaks & DrumMania artists who composes and sings his own songs frequently, the others being Asaki, Akhuta, Daichi Watanabe, and Osamu Migitera. According to Yoshihiko Koezuka, Mutsuhiko Izumi instructed him on using the recording equipment when he joined KONAMI. It is been speculated that Yoshihiko Koezuka might be the producer of some of the ひまわり∗パンチ songs in GITADORA Tri-Boost. Yoshihiko Koezuka was going to be the sound director of the cancelled BEMANI game おといろは. This page was last edited on 12 April 2019, at 18:36.